This E5000 - 2880 Folding Propeller Kit from DJI includes two CW propeller blades and a folding propeller adapter. Each of the blades are 28" in diamater and are made of Ultra Carbon Pro, with a high strength- and stiffness-to-weight ratio. The adapter is a foldable mechanism that allows you to mount the props to the E5000 motor. The blades and adapter are designed specifically for the E5000 system. Installation hardware is included. 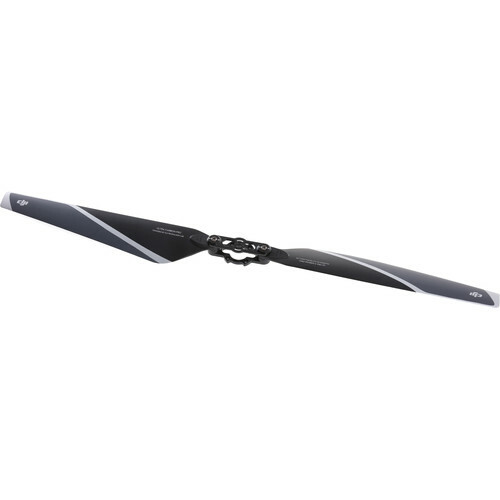 This is a 2-pack of E5000 - 2880 Folding Propellers from DJI. Each of these 28" propellers is made of Ultra Carbon Pro, an advanced composite material with a high strength- and stiffness-to-weight ratio, ensuring aircraft is responsive to control inputs quickly regardless of size. These props combine with the M10 motors to give the E5000 system its 4.5-6.0kg per axis load capacity and maximum thrust of up to 13.2kg per rotor. The E5000 - 2880 Folding Propellers are designed specifically for the E5000 system and should only be mounted using the E5000 - 2880 Folding Propeller Adapter (sold separately). The E5000 - 2880 Folding Propeller Adapter from DJI is designed to work with the E5000 propulsion system. This adapter is a foldable mechanism that supports both clockwise (CW) and counterclockwise (CCW) E5000 - 2880 props. One adapter can be paired with two propeller blades. An accessory pack of washers and screws is included.